On this day, the 16th Ohio was awakened at 3:00 am and prepared to move. By 8:00 am the regiment was loaded aboard train cars and started their journey east, arriving in Algiers, Louisiana, about 1:00 pm. The first thing we saw when the train stopped here Sunday evening were our Chickasaw Bluffs prisoners. You may bet we were glad to meet them again. They are exchanged and were just waiting for a train to take them to Brashear City to meet us. They were out on dress parade with us last evening and I tell you now it made a vast improvement in the size of the regiment. We looked more like a regiment than we have ever done since the battle of Chickasaw Bayou. They came very near not meeting us at all for as they came down the river they were fired into by a large force of rebels and had it not been for the fog they would have been captured again. There were about 12,000 rebels -- part on one side of the river and part on the other side. They were trying to cross into Arkansas. The Captain of the boat wanted to surrender his boat but the boys threatened to shoot him if he did. They at first thought it was guerrillas and wanted to land and flax them out -- it would have been fatal to them had they gone ashore. 1863 military map showing the approximate route of the 16th Ohio from Brashear City (Morgan City) to Algiers, Louisiana, on November 22, 1863. 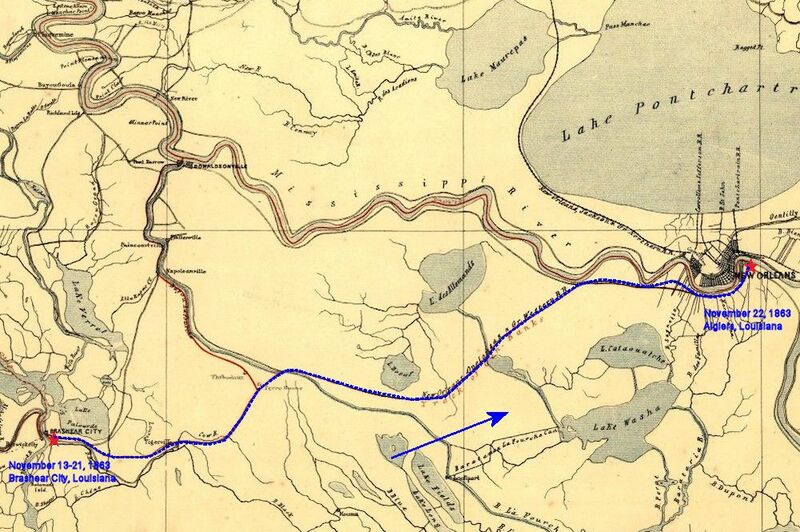 The regiment would have taken a train running on the New Orleans, Opelousas & Great Western Railroad. Modern day map showing the approximate route of the 16th Ohio from Brashear City (Morgan City) to Algiers, Louisiana, on November 22, 1863. 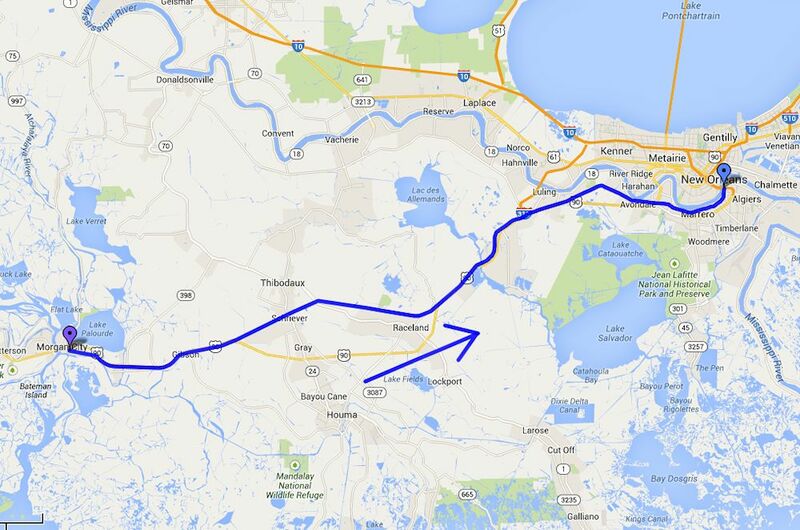 The regiment would have taken a train running on the New Orleans, Opelousas & Great Western Railroad. Purple pin - Approximate location of the 16th Ohio on November 13-21, 1863, at Brashear City (Morgan City), Louisiana, where the regiment camped for nine days. Blue pin - Approximate location of the 16th Ohio at Algiers, Louisiana, November 22, 1863.